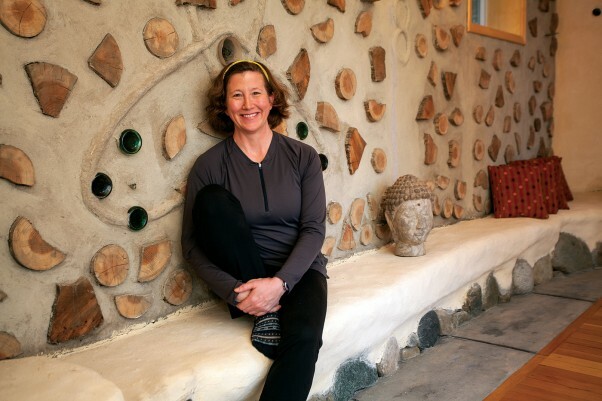 In Yvette Menard’s hand-built studio in Seal Bay, she is using yoga to heal the invisible wounds of war. This is where Mike (not his real name), a Canadian Armed Forces electronics technician stationed at the Comox base, comes with his wife once a week to find relief from the debilitating symptoms of Post Traumatic Stress Disorder (PTSD), a condition he’s lived with since returning from active service in Afghanistan six years ago. Yvette, a former Medical Assistant and Dental Officer in the Canadian Armed Forces (CAF), is the first Canadian graduate of a program called Warriors at Ease, which trains yoga teachers in the theory and techniques of trauma-sensitive yoga, an approach that shapes the yoga experience to be safe, supportive, and effective for people who’ve undergone trauma in their lives. While yoga doesn’t “cure” PTSD, it has proven to be a powerful tool to ease its symptoms and help sufferers return to a fuller, healthier, more connected life. In fact, its effectiveness as a therapy for PTSD, anxiety, depression and other related disorders is backed up by dozens of scientific research projects. But Mike doesn’t need studies to know that yoga has helped him. “There is no cure for PTSD. You won’t ever be like everyone else. But you can learn some ways to cope, to make it easier. Without yoga, I was disabled. With yoga, I can change. I can write my story differently,” he says. I meet Mike and his wife Elizabeth one sunny afternoon at Yvette’s studio. In this tranquil space where they have experienced much-needed relaxation and comfort, the couple share their story: “I joined the forces when I was really, really young; I was still 17,” says Mike. “I wanted to do something with my life, to make a difference. Mike didn’t falter while serving in Afghanistan. He was exposed to numerous combat situations that included everything a soldier expects while in a war zone. He suffered physical injuries that were treated immediately. What he didn’t realize was that there were invisible psychological injuries that would take years to manifest. In retrospect, and with a perspective informed by his yoga experience, Mike is able to identify, with heart wrenching clarity, the source of these injuries. Mike’s eyes fill and he pauses. The studio is silent except for the sound of his breath, controlled and slow. Elizabeth sits very still, her eyes on his face, and slowly reaches out to touch his shoulder. A few more breaths and he continues. Mike’s natural toughness and his military training kept him functioning. It wasn’t until he’d been home for about six months that he began having symptoms. Mike had no clue that these physical symptoms could be caused by a mental health condition. He did see a military counsellor once—after he’d answered positive to a question about anxiety in a questionnaire—but never followed up. For the next four years he stuffed his feelings down and ignored his symptoms. Then one day he crashed. “I watched a TV documentary called Hell’s Highway Afghanistan and everything caught up with me. I lost 47 pounds in two months. I went down into massive depression. I couldn’t sleep because my body was so sore. I was so exhausted. I would be sitting on the couch for four days solid with a heating pad,” he says. Luckily, communication between mind and body is a two-way street—the mind, if injured, can wreak havoc with the body, but working skilfully with the body can calm and heal the mind. Mike had tried exposure therapy, talk therapy, group therapy, and medication, some of which helped, but not enough. He was still in pain daily, still vulnerable to triggers that would plunge him into panic attacks or downward spirals of depression. One day Mike heard, through an email from the base, about Yvette and her offering of yoga. He decided to give it a try, even though he’d never thought of himself as a yoga type. The Warriors at Ease approach is designed not to weird anyone out—this is a key element of trauma-sensitive yoga. Yvette doesn’t use any Sanskrit terminology, doesn’t play music, and steers clear of overt spiritual or religious themes. Her studio has no doors and windows on the back wall, so that students know their back is safe. She does not touch students unless she knows they feel ready. She includes a lot of repetition within a class and between classes so that the work feels predictable. If a student is lying down and Yvette needs to walk around them, she will tell them exactly where she is moving. And she avoids language such as “surrender” or images such as “you are sinking into the sand” which in a mainstream yoga class might solicit relaxation, but for a veteran who’s served in Afghanistan can signal failure, danger or death. Because of these elements, both Mike and Elizabeth found their yoga experience welcoming, right from the beginning. As well, they appreciate the intimacy of the private sessions. “You’re on a sensitive line here if you’re going to open up and show emotion. It’s hard to do that in a group,” says Mike. Being able to allow feelings to flow, without disassociating or feeling overwhelmed, is part of the therapeutic process, and trauma-sensitive yoga is designed to provide a safe and constructive way for this to happen. Yvette, along with Warriors at Ease and other similar organizations, is working on bringing this type of support to more members of the military. There’s no doubting the need—statistics from the Canadian Department of National Defence tell us that 20 per cent of Canadian service personnel deployed to Afghanistan were diagnosed with a mental health disorder attributable to their military service, and a Statistics Canada study that looked at a longer time-span concluded that 30 per cent of military personnel involved in combat operations risk suffering from PTSD or major depression during their lifetime. This is the need that drives Warriors at Ease. Although it might surprise people who think of yoga as either a new workout and fashion trend, or a mysterious, incense-scented esoteric practice, this ancient discipline is increasingly being recognized as a healing art and science. Over the past 20 years or so in the multi-faceted yoga world, there’s been a burgeoning of training programs, professional associations, publications, research projects and conferences on therapeutic yoga. “Yoga Therapy” is now appearing as a program at colleges, and mainstream medical institutions (even some insurance companies) are starting to recognize yoga therapy as a valid discipline. Warriors at Ease was founded in 2008 by three yoga teachers and researchers who were already immersed in work with military personnel, and since then has trained more than 220 yoga and meditation teachers to serve in military communities. Yvette’s journey to becoming a Warriors at Ease teacher encompassed a military career, a medical career, yoga, and a first-hand experience with post-traumatic stress. She first put on a uniform at the age of 13, when she joined the Sea Cadets, and then transitioned to the Naval Reserves at 19. Taking a pause from the military in order to concentrate on her children and education, Yvette put herself through dental school, and then ran her own dental practice for seven years before joining the Armed Forces, successfully completing Basic Officer Training at the age of 47. “I loved it. I loved being in uniform. I loved the culture and the community,” Yvette says. While waiting for pre-deployment training for Afghanistan, Yvette transferred from Esquimalt to Comox. “Within a few days I realized my boss apparently hated me,” she says. Thus began seven months of daily harassment and abuse. Yvette’s experience follows a course that, sadly, is much like that of other women who encounter abuse in patriarchal, hierarchical organizations. “At first I made excuses for him. It was hard to wrap my head around it because it wasn’t the enemy I’d been trained to expect. It was someone wearing the same uniform as me.” Once she realized she needed to act, things just got harder. “When I went through the chain of command, there was almost denial. I learned he had a history of bullying. It took a year to get agreement to do a harassment investigation and several more months for it to begin. The result of all this—a conclusion of sorts—is that ‘‘corrective and remedial actions’ were taken against her superior, and Yvette was released from the CAF with a diagnosis of Generalized Anxiety Disorder for a mental health injury (it’s important, she notes, to differentiate between an illness, which comes from within, and an injury, which is caused by external forces). Another result—not a conclusion, but rather a beginning—was Yvette’s decision to commit to becoming a Warriors at Ease teacher. “Through this difficult experience, I found the true power of a dedicated yoga practice. I feel like I have found my true calling,” she says. She got the training she needed, built a studio on her property, and started teaching. The next big step for Yvette involves getting the CAF to recognize yoga as a complementary alternative therapy for PTSD and included in the array of treatments officially offered. This has already happened in the United States, and Yvette is confident that at some point (hopefully sooner rather than later) it will happen in Canada. “I’ve succeeded in getting some support—the Integrated Personnel Support Centre has included information about what I offer in a mass email. But in terms of going further, Veteran Affairs is being cautious for now,” she says. Yvette currently offers classes free of charge, volunteering her time, but can only commit to this until the end of 2014. She is hopeful—indeed, determined—to see Canada follow the US example, not just so that she can follow her calling, but so military personnel and veterans all over Canada can have access to the healing power of trauma-sensitive yoga, to help them ease the pain of their invisible wounds. and cubbies full of children’s gear at their height have a Miniature Land-like quality. Heading down the hallway the colors shift from pale red through the hues of the rainbow, ending with purple at the Kindergarten door. Felted pictures hang on the walls, and everything seems to reflect the dreamlike quality of childhood. This independent, Waldorf-inspired curriculum based school has been operating out of Tin Town in Courtenay since September of 2011, and is strongly upheld by a community of devoted parents, teachers, board members and volunteers. Dedicated to nurturing the whole child, the school’s developmentally based curriculum is rich in the arts, music, movement and contact with nature. Five years ago, Saltwater itself began as a dream. A few parents in the Valley were looking for a school that did not exist—and so they created it. Rebecca Watkin, Michelle Nagle, Kendra Quince and Michael Vincent began as a board of four who worked together to bring the school to fruition. A first attempt began with Watkin and Quince and a handful of other people who met in 2006, but their children were only a few months old at the time, so plans for a school fell to the wayside as parenting young ones took precedence. Then, in the spring of 2009, Watkin started to blog about bringing Waldorf to the Valley. “Just reaching out and meeting a few people began the process,” she says. Watkin, who had taught at the Vancouver Waldorf School for three years, was at that point commuting to teach at the Morning Glory Waldorf School in Qualicum Beach. She was interested in creating a Waldorf initiative in the Comox Valley for her own family, and for those who she knew were out there wanting the same thing. She connected with Michelle Nagle, a young mother who had attended the Vancouver Waldorf School for nine years from Grade 4 through to high school. Nagle had recently moved to the Comox Valley and knew she wanted to pass on the gifts she received in Waldorf education to her own children. Watkin and Nagle began to meet, and Quince, who was also seeking an alternative education for her children, joined them. Quince began her Waldorf Kindergarten teacher training at the West Coast Institute for Studies in Anthroposophy in the summer of 2009. 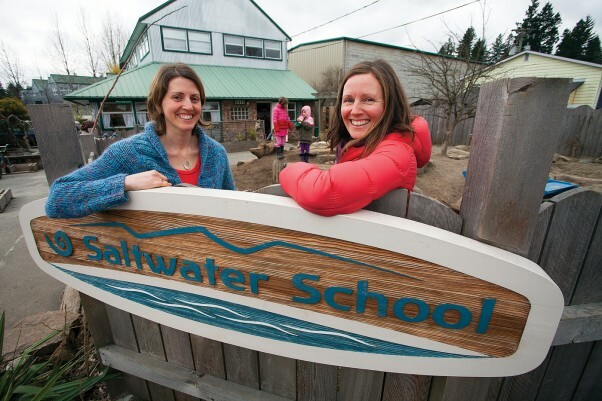 Both Watkin and Nagle felt the same, and Saltwater School was created as these three mothers began to build a dream for their children. Michael Vincent, who came across the movement at one of their outreach events, quickly joined the board, bringing with him a knowledge of business and a passion for helping that added a solid dynamic to the creation of Saltwater. He also had a child whom he hoped to build such a school for, and things unfolded from there. Saltwater School, a nonprofit organization, unofficially began in 2010 in the homes of Quince and Watkin. While a benefactor had expressed interest in purchasing a space for the school to operate in, nothing that seemed to fit the budding school had been found, so Class One started with four students in Watkin’s home and Quince expanded her Preschool Program to include a separate Kindergarten Program, with 10 students between the two. Saltwater School moved to its current Tin Town location in 2011, and officially opened its doors in September of that year. What began as a board of four people has very quickly become a community. The programs at Saltwater School have also expanded, and currently include a Parent and Tot Program, an afternoon Preschool, a Mixed-Age Kindergarten and Grades 1-5. This fall the school will also include Grade 6, as each year a new grade is added. The plan is to go up to Grade 8. A second building in Tin Town has also recently been purchased, as the school is bursting in its one location. “The second building will be ready for the fall,” says Watkin. “The plan is to keep the current building for the ECE [Early Childhood Education] programs, and move the Grades to the new building.” The new building also has a yard. “We have a cohesive school community,” says Nagle, who sees how social relationships in the school stretch beyond the grades. “There is a social literacy we are fostering here,” she says. Grade 4 students recently wrote and illustrated stories about when they were in Grade 1, and presented them to the Grade 1 class to read. Last year the school teamed up with Tin Town artists to create a chalk mandala, and Saltwater reaches into the larger community of the Comox Valley through festivals such as the Maypole dance and other activities. What exactly is “Waldorf in the Valley”, as the bumper sticker on all the cars in the school’s small parking lot proclaim? A typical Kindergarten day includes outdoor time, singing, a warm snack prepared in the classroom such as soup or rice, and the daily activity, which ranges from painting to baking, and every day includes free play. Other activities that can be part of a day, especially in the grades, include music, languages, woodworking, theatre, cooking, handwork, outdoor pursuits, main lesson (which presents the BC curriculum through an artistic approach,) yoga, and/or spacial dynamics, a movement class that helps to bring children into their bodies, and thus into balance. 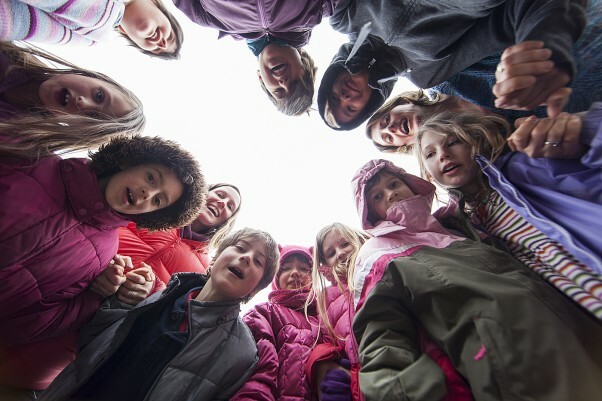 Nature and the seasons play a large role in Waldorf schools, where a portion of every day is spent outside. Each classroom also reflects the seasons in some way. Whether it is a ‘nature table’ where the children can bring in things from the outdoors, a display created by the teacher, chalk board drawings, or seasonal crafts being presented, there is always something that reflects the rhythm of the outdoors. “One of the things that has consistently inspired me is bringing nature into the classroom and using nature as the classroom,” says Nagle, who would like to expand the Outdoor Pursuits program at the school to include such things as sailing, camping excursions, and kayaking. The program currently includes snowshoeing, cross country skiing, caving, dragon boating, and biking. This connection with nature “helps each of us to respond to our daily life by connecting us to the bigger picture… nature holds the truth of life that we are,” she says. While classes at the school are almost full, Watkin says that “each year we look forward to meeting new families in the Early Childhood Programs.” Applications for enrollment in all the programs are currently being accepted. While Waldorf is new to the Comox Valley, it is not a new concept. Originating in Austria in 1919, and created by a man named Rudolf Steiner, more than 600 Waldorf Schools can now be found worldwide. These schools foster a love of learning from an early age by connecting with the individual child as part of the whole.